EARTH University’s partnership with Sustainable Harvest began in 2015, when the organization first agreed to host EARTH student interns. Since then, a dozen EARTH students from six countries have worked with the nonprofit organization in order to fulfill their 15-week internship requirement and provide meaningful support to rural communities in Belize, Panama and Honduras. This year, the relationship between both organizations has grown even closer. EARTH Professor Irene Alvarado – supervisor of internships – identified the opportunity for generating greater impact through collaborations beyond internships. “When I was there [in Panama, at a Sustainable Harvest site], I realized that both organizations had a lot in common as well as great opportunities to deepen our impact and jointly foster leadership for rural sustainability,” Alvarado said. Feeling inspired, Alvarado teamed up with Amy Porter, coordinator of the third-year experience at EARTH, and Mauricio Segura (’07, Costa Rica), director of academic administration, to facilitate the creation of the workshop Taller Cosecha. 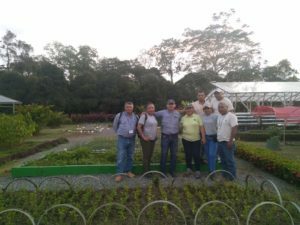 Taller Cosecha equipped Sustainable Harvest contributors with scientific and technical knowledge that would aid them in accelerating the development of communal competencies around sustainable agriculture. 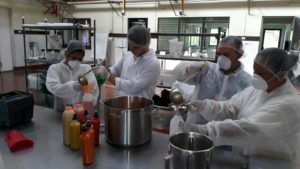 Learning value-added techniques in the food processing lab. The four-day training took place at EARTH’s Guácimo campus and involved hands-on theoretical-practical activities. Sustainable Harvest staff learned about natural agricultural inputs, the various processes behind dried fruit production, circular economies, locale-apt renewable energies, and climate change adaptation and resilience among small producers. Many EARTH faculty and staff members played a part in the workshop’s success. A special thanks to Ivannia Sánchez (manager of the Food Processing Lab), Arnoldo Ávila (manager of the Integrated Organic Farm), Lorena Aguirre (academic support manager) and Karina Poveda (’13, Costa Rica) from the EARTH Futures team, as well as Dr. Bert Kohlman and Nelson Jiménez from the Center for Research and Development in Renewable Energies. Together, EARTH University and Sustainable Harvest will continue impacting Latin America’s agrarian communities.